Yesterday afternoon I once again got to tour Main Street in HEC. After delivering a recent painting to the new owner I had a little time to walk around and view the agonizingly slow progress. Kudos to those painting the plywood covered storefronts to look like they are inhabited. As I recall, before the flood, there were seven galleries in town, now just two have returned. After the permanent departure of Perspectives Art Gallery, I am without gallery representation. That has worked out just fine for me as collectors can easily find me via the internet, as many have. However, I do look forward to returning to Main Street in some as yet unknown gallery. 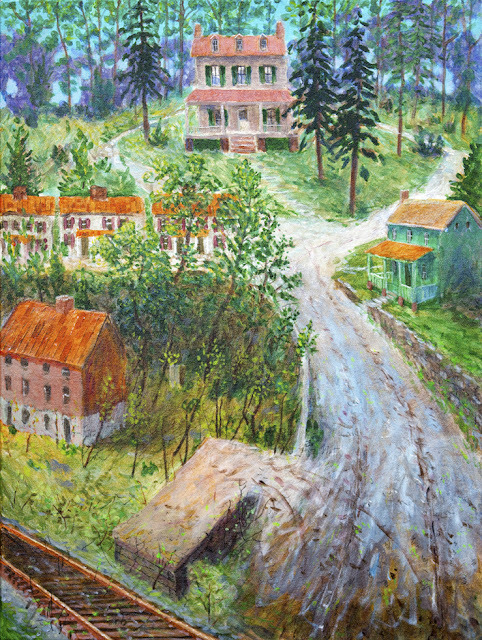 My work is of course forever linked to the Ellicott City Historic District, and I am working on quite a few new EC based projects.